Rose Tyler, a young shop assistant in a London department store, lives a humdrum and profoundly average life – until the night the shop dummies where she works wake up and try to kill her. Her life is saved by a strange man who only calls himself The Doctor, and intrigued by him, she finds herself thrown headlong into a hectic battle to stop an alien presence from invading Earth and annihilating the human race. 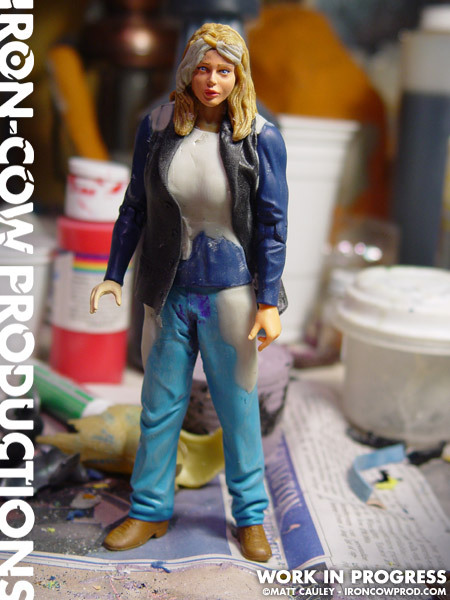 The Billie Piper ROSE TYLER action figure sports a variety of parts. She began as a Vampire Spike from the Buffy/Angel figure line. I replaced Spike’s torso and hip region with parts from a Kill Bill UMA THURMAN figure. The lower legs are from the Texas Chainsaw Massacre ERIN figure, while the head is reworked from a Shrek PRINCESS FIONA figure. Magic Sculpt was used extensively to reshape the body and create other surface elements. The Billie Piper ROSE TYLER action figure stands 6″ tall and features 10 points of articulation.